The beautiful buildings on the Capitol campus are full of thousands of decorative details. So many details in fact, that visitors and workers alike will often see something new each time they are here. This richness and depth inspire me every day. I've always wanted to be an architect. So naturally, one of the details that really speaks to me is one that symbolizes architecture. It sits, unnoticed by most, but always catches my eye, on the north staircase of the Library of Congress Thomas Jefferson Building's Great Hall. There, at the very top, is a balustrade ornamented with three marble putti representing the fine arts: Painting, Sculpture... and Architecture! Architecture putto (center) with the Parthenon represented behind it. A putto (plural putti) is a male child figure, sometimes with wings, used as a decorative architectural element. Behind the Great Hall's Architecture putto is a depiction of the magnificent Parthenon on the Acropolis of Athens in Greece. Whenever I see or think of the putto, I'm taken back to a time when I had the opportunity to travel the world and visit the great places that I studied in architecture school. Both the Parthenon and the Capitol have a deep connection for me. They use slight visual cues to reinforce their stately appearance and include fine examples of the Doric order of architecture. Both buildings are also situated on what was considered the grandest spot in the city, atop an elevated area or as Washington, D.C.'s engineer and architect, Pierre Charles L'Enfant described Capitol Hill, "a pedestal waiting for a monument." 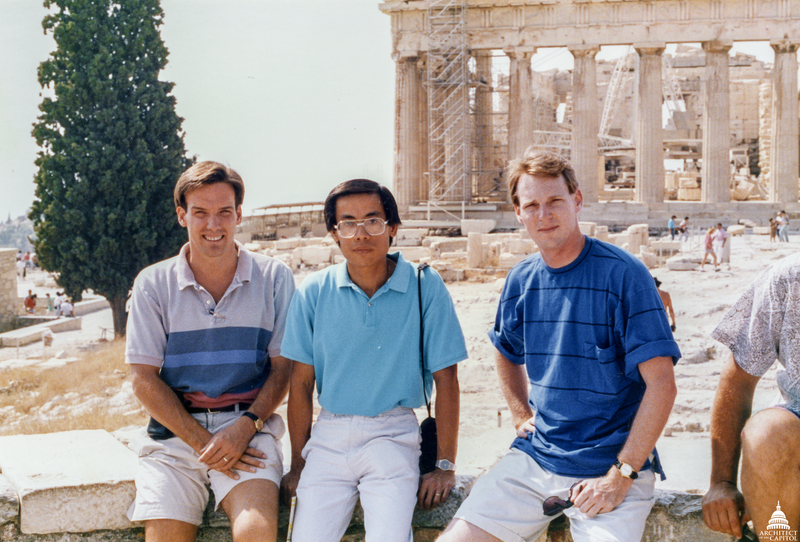 I remember walking away from my visits to the Acropolis thinking that there is so much more that could be done to preserve and invest in those important parts of our history. That sparked in me a true desire to be a steward of the great buildings in the world. The Architecture putto with its Parthenon behind it is a visual reminder for me of that time in my life, which eventually brought me to serve at the Capitol. Next time you're walking around the buildings and grounds of the Capitol campus and are in need of some inspiration, pause a moment. Take in the details, and see where they take you. This story is also published in the Winter 2016 issue of AOC's Tholos magazine. Stephen Ayers spoke to our group (IFMA) last year and his team is always willing to share information on current projects. His enthusiasm for the work he would never call a job is special and extends so much deeper than this article. Could not think of a better person to lead that special group working for the AOC! They do so much in such a special place that serves so many! Well done Stephen and all AOC staff!